Chemicals for Nuclear Industries | Fine Chemical Area | Service | TOMIYAMA PURE CHEMICAL INDUSTRIES,LTD. Stable power is supplied from nuclear power plant night and day. Running of nuclear power plant requires safety measures without even a trace of compromise allowed. Our company's high-purity Boric Acids play an important role in the safety running of the plant. 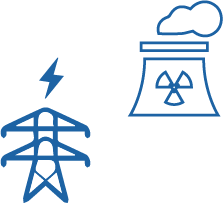 With characteristics of stable isotope being a good neutron absorber, our high-purity Boric Acids contribute to the safety of the power plants as well as their surrounding areas. © 2018 TOMIYAMA PURE CHEMICAL INDUSTRIES,LTD.All rights reserved.